He plans to keep making games until he dies. A few weeks ago, Peter Molyneux gave an interview in which he was quoted as saying the next game was making could be his last one if he kept tinkering with it. From those words, it was totally possible to interpret that Molyneux believed he only had one good game left in the tanks. He's not a young fellow, so the story made sense that he wanted his return to the god game genre with Godus to be his swan song. After asking Molyneux point blank whether he planned to retire, he said that was all wrong. "I was talking about how the philosophy of making games is different now," Molyneux said. "When you make a game and release it, you don't finish the development you just continue the development, you keep enhancing it and updating it." Given that, he went to say, "it's conceivable that I can make a game and then never finish the game, and it could be my last game." He looked at other games and the models they've been working under for the last few years of game development. World of Warcraft essentially being the same game even though it's been adapted and changed for 8 years. "If you look at Minecraft and what they do is they've been working on it for a very long time and it's still evolving and changing and getting better," he said. Somehow the way he expressed that idea was transformed into Molyneux announcing retirement, but he told me that's just not the case. "I'll retire when I die," he said. "Or when people tell me to shut up, I guess." 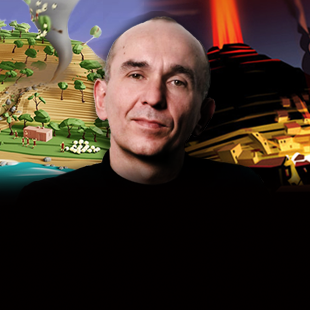 For more on my discussion with Peter Molyneux where he talks about how frightened he still is of failure, check out the write up of my interview on Godus here.